When I was still in training, a school librarian came to an event at the library and asked me and the former librarian to participate in a Read Across America event at her school. Hooray for being approached by other librarians! So I got in my car on my day off and went out to the school to hang out with the kids. Since it was going to be just me at the event, I had to make a quick call. Do I attempt to sign people up for cards while also trying to keep kids amused with the game I brought? Or do I just have a parent fill out a form so that I can set-up the card back at the library and play with the kids in the meantime? I went with the second option, which turned out to be for the best. We had around 70 kids come by, 52 of whom wanted to play Dr. Seuss Twister with me. If I had been trying to key in card information, I would have been very overwhelmed and probably would have missed the opportunity to have fun with the kiddos. I took goodie bags/prizes with me for anyone who played Twister. Whether they won or not, I let them pick between either a glowstick bracelet or a little bag of Dr. Seuss goodies. (Target has a great deal on 15 glowstick bracelets for a $1.) 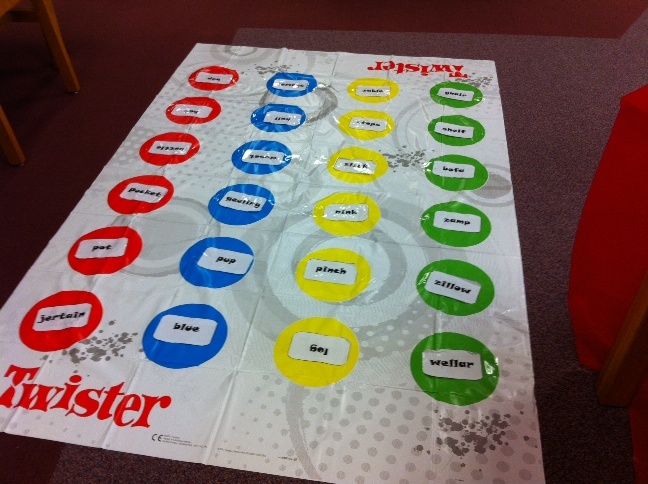 Dr. Seuss Twister entailed finding rhyming Seussical words and then writing one on the spinner and the other on a circle. I printed and taped down my words so that I could re-use the game with different words or none at all. Since these were elementary kids, some of the younger ones needed a little help, but I was quick to give hints and very forgiving when a child toppled over or couldn’t reach. 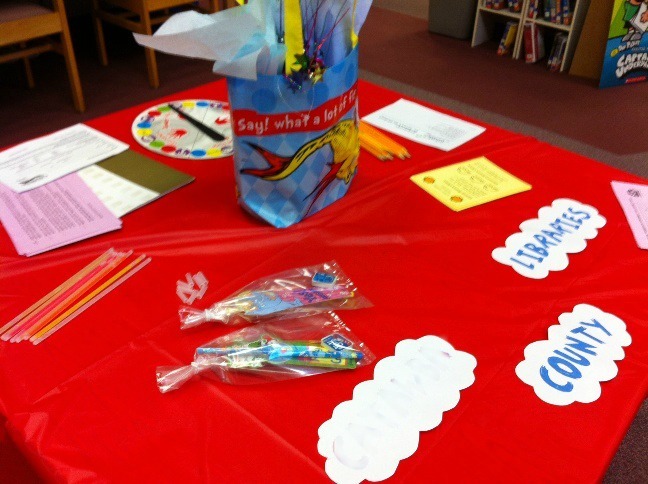 Since there were so many kids, I let each set of kids go through a few words each before giving them their prize. Fun was had by the smallest and biggest alike.